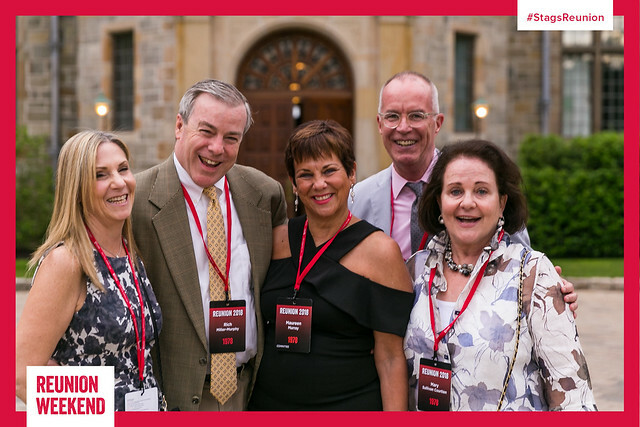 Fairfield University's Reunion 2018 was a Weekend to Remember! Fairfield's 25th Reunion toast during Reunion 2018. Nearly 1,500 Stags and guests ventured back to Stag Country during Reunion Weekend, June 8 - June 10, to reminisce, reconnect, and create new memories. Earlier this month, nearly 1,500 alumni and guests returned to campus to celebrate Reunion 2018 from Friday, June 8 to Sunday, June 10. On a picture-perfect weekend, this year’s Reunion alumni—those in classes ending in a 3 or an 8—enjoyed reconnecting with friends and classmates and exploring Fairfield’s ever-evolving landscape. The weekend kicked off on Friday night with receptions on campus and, for the milestone 25th Reunion class, at the Seagrape. The celebration continued on Saturday with a full slate of events, including a “Meet the Faces of Fairfield” reception with President Mark R. Nemec, PhD, and other members of the faculty and staff, the Taste of Fairfield food fair, and the annual Reunion Mass. Saturday concluded with a dinner on Bellarmine Lawn, where over 1,000 guests danced the night away. Also coming home to campus that weekend were the Golden Stags, those alumni who graduated from the University more than 50 years ago. Many of the Golden Stags participated in the various Reunion activities during the day and then had their own special dinner, with remarks from President Nemec, in the Dolan School of Business on Saturday evening. A good time was had by all and planning is already underway for Reunion 2019. All alumni in classes ending in a 4 or 9, mark your calendars for June 7 – 9, 2019!